← We’re a house! With a living roof! Getting ready for the Big Show! Places, everyone! We cannot keep away now — we drop by the house every day. And every day we see more developments. Today we couldn’t enter the house because we could hear the whine of the paint sprayers inside. We admired the siding appearing on the exterior and the forms all ready for the concrete walkway and deck. The rush is on, not just for us, but also for the Vancouver Heritage Foundation’s Laneway House Tour on Saturday. We’re chuffed to be part of the tour, and want to put our best face forward. That’s our crew. Cute, yes? Local media are writing up the tour, as in this story in the Vancouver Courier. 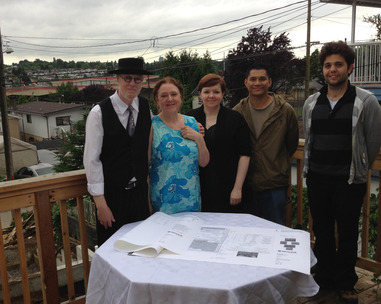 The house and laneway featured in this story are up in Marpole. “It originally sat here on a larger piece of property and was one of the original south Granville farmhouses built in 1912. It would be one of the very few surviving houses in the neighbourhood,” said Roberts, who’s owned it for about five years. Laneway homes are being celebrated for helping retain the charm and character in older neighbourhoods while still supporting densification. Will we see you on Saturday? We’ll be there, and the house will be about 90% finished. We are keeping our fingers crossed that BC Hydro will have us hooked up by the time of the tour, but that is completely beyond our control. Except for the finger crossing of course. Novell has promised to have something special for people who come to our house. And N.A.T.S. Nursery might be there, too to talk about living roofs. Hope to see you! Be sure to say hello. Posted in Laneway House and tagged Lane Home, Lane house, Laneway House, Small Style, Vancouver Heritage Foundation Laneway House Tour. Bookmark the permalink. I just devoured your whole blog in the last two days as research for the upcoming laneway tour! We are very excited to see the finished project and your story has been inspiring to live smaller. Thank you! Come and say hello if you get to our place! We want to make sure we get to your place and last year we made it to all but one home in the allotted time. Tickets have been purchased on our behalf but we’ve been given the addresses and neighbourhoods. How do we know which place is yours? Our home is the last on your ticket — at East 8th and Windemere. The picture on the ticket shows the house as it was — the siding is all on and should be primed in white for the show. Be sure to say hello!